One of the biggest talking points at E3 this year has been used games and how publishers and developers are trying to stop them from putting a dent in their profits. Of course, when buying a used game all of the proceeds are given to the retailer. Several strategies have been conjured up over the years, from online passes to registration fees, but Nintendo seems to be taking a different route: make games so good players won't want to trade them in. We understand that used games are a way for some consumers to monetise their games. They will buy a game, play it, bring it back to their retailer to get credit for their next purchase. Certainly, that impacts games that are annualised and candidly also impacts games that are maybe undifferentiated much more than [it] impacts Nintendo content. Why is that? Because the replayability of our content is super strong. The consumer wants to keep playing Mario Kart. The consumer want to keep playing New Super Mario Bros. They want to keep playing Pikmin. So we see that the trade-in frequency on Nintendo content is much less than the industry average - much, much less. Nintendo's strategy does not involve registration fees or any other restrictions. The onus is on itself to create great content so players will hang onto their copies. We have been able to step back and say that we are not taking any technological means to impact trade-in and we are confident that if we build great content, then the consumer will not want to trade in our games. During the interview, Reggie went on to say Nintendo will continue to support retailers as they "play a huge role in driving awareness" for its releases. He made reference to Best Buy, which is currently showcasing several Wii U games for people across North America to experience in 100 of its stores. Digital game sales may be increasing year-on-year but Nintendo still sees retailers as an important part of its business model. Used games are a big deal for publishers and consumers alike. These policies could well affect people's choices, but considering Nintendo has no policy on it whatsoever it certainly isn't doing itself any harm. Do you think Nintendo is right, or should it be using technological means to restrict used games sales? Let us know in the comment section below. Man, that made me laugh out loud. I've always noticed that the price of used Nintendo games are (almost always) dramatically higher than other publishers. The only time they ever seem to drop in price is when Nintendo specifically does the "Selects" lines (or in rare cases such as Other M). "....or should it use technological restrictions to used game sales?" Gotta love that spiel about used games. Just insert the word "automobile" for "game" and hear how rediculous the conversation is. For almost 50 years gamers have been able to buy, sell, and trade their own games. It has led to a healthy collector's market as well. The persistence of publishers in this area will collapse the game market of big publishers. The rebuilders will come from affordable Indy titles. Who will pay top dollar for a AAA game at $50-100 when the consumer does not even own the rights after purchase? The market value will drive consumers towards less expensive titles with more value. Perhaps it is the publishers AAA, hyper-realism that demands motion capture, CGI, and huge dev teams over fun games that creates the need in publishers' minds to make up that money? Or it is simply greed. The next year will be interesting to see how the consumers drive the industry. I had a dream this morning that Nintendo will keep moving their OS towards a truly portable gaming tablet, with viable inputs and needed horsepower included. One can hope. It didn't come across as egotistical to me. I can think of a lot worse to say about third party companies like EA. Nintendo makes great games, their track record for quality is much higher than any third party company out there. It's this kind of attitude that will keep them the best video game developers for years to come. Give them the credit they deserve. If you like how he said it or not, I think he's very right here. I know people that aren't even Nintendo fans as I am, but enjoys sitting down and playing, well Mario Kart for instance. Seems as if first party Nintendo games, have more replay value, and memories to them, then any other video game maker out there. Reggie's right. I loved Bioshock infinite for a couple of days, but eventually traded it in, however new super Mario brothers and nintendoland would be insane to trade in because of the social aspects they bring. @LDXD and want to keep the game after completion, so you can go back to it and enjoy the game again. Oh wait Usually... that is Nintendo published games. He has a point in the sense that great games are seldom for resale because people will most likely want to keep them in their collection for their replayability. There are a lot of mediocre to really bad games (usually movie tie-ins and other spin-offs) nowadays that reselling has just become a convenient back up plan in case people didn't like the game or got tired of it after a few hours. Hence why a lot of Xbox & Playstation fans, As well as industry insiders want Nintendo to go Multiplatform. Nobody makes games like Nintendo, Sega were the closest in thier hayday, but even now Sega lag behind in a lot of cases, cause & effect of being tied to others hardware most likely. Also a reason all those Nintendo are doomed articles steming from various sources are more Wishfull thinking put in print, than factual news. Bethesda basically said the same thing and look at some of their games... Oblivion, Fallout 3, Skyrim, and Morrowind... those are games you don't want to trade in and you want to keep playing. I usually end up buying Nintendo stuff new because I rarely am able to find them used! Well, the fact remains that I still have Super Mario Galaxy even though it's 5 years old. I have a pile of DS and 3DS (some Wii & Wii U too of course) games that I would never sell, because I want to be able to play them again later. I'm glad I can borrow them to others, but I rarely do that. I think Nintendo are right to let people own the copy of the game, and be free to sell it or give it to others if they like to. That also makes me more confident about buying a game I'm not sure I'll like, if I end up not liking it at all, maybe my boyfriend will. But Nintendo games have such strong resale value. I still buy any Nintendo published N64 games whenever I see them at thrift shops or garage sales because they sell for so much more. That being said, it's pretty rare these days for me to sell a Nintendo game I bought for myself. @MisterRJ45 I've heard stories of a lot of people buying bethesda games, getting tired of them, selling them, and then buying another copy later because they decide they want to play some more. I can find nintendo stuff used, but it's usually only $5 off and a huge quality drop. I've never been a fan of Reggie Fils-Aime but I absolutely agree with him on this. I agree - the only games I sell of sucked to the point of either not finishing them or never wanting to play them again. If they are good, I'll keep them and replay them. I'd much rather see companies focusing on making good, replayable games versus trying to hamstring them through some technological means. And if the real issue is that they get no money from used games - make your own used game buy back and resell program! Sell back a game you don't want for credit in whichever system's marketplace for buying something else or a gift card to use for hard copy games. I agree fully. If you dont want your customers to sell their games off to other people, make games that nobody wants to sell because their simply that good. Games of todays generetion are so shallow, that they are instantly replaced by their respective follow up game. Thats why you see tons and tons of Fifas, CoDs, Assassins Creeds and so forth at gamestop, but finding something like, say, Mario Kart Double Dash or Tales of Symphonia (i chose these two because I serched for them for ages) comes close to a miracle. Nobody wants to get rid of them. No Mario Kart was ever replaced by another, every game has its own unique things about them, that they stand each for their own. I know no one that ever said "Super Mario World is just Super Mario Bros with better graphics" but that kinda stuff is said about, say, CoD all the time and thats why people want to sell these things. Why own a game that is essentially the same as its new installment but looks simply worse and / or noone paticipates in online matches anymore since the new installment released. These games loose their worth so fast,since there is simply no "heart" to them. If publishers made great and creative games that would end the flood of endless sports updates that get traded in and end up in flea markets. Do anyone resolution sad at poor Microsoft? They have a knife in there ribs and everyone is twisting it lol. He has a point, y'know. Make the games good enough so people will want to keep them forever. This is why dependency on online multiplayer is causing a flood of used games. Not enough attention is paid to the single player campaigns. It takes some big balls to make a statement like that, luckily for him every single word is true, especially when it comes to annualised franchises. Nintendo has always been about quality, if on the occasion where quality has slipped due to letting somebody else develop with a Nintendo franchise theybdropnthe price accordingly. Big point in case is Madden 20-- this game comes out every year and is virtually the same game, madden 13 results in every madden 12 coming back in during the lead up tonits release before its trade in value bottoms out, and any potential buyers of madden 12 pick it up second hand leaving the reams of new copies sat in stock piles. Solution, build a formidable game engine, then annually release update DLC with any control revision an roster updates for £19.99. Only release an entirely due product at retail on disc/eshop at full price when you have actualy brought a complete overhaul to the table which maybe every four years. People wt more game for their money, EA keeps making money at low distribution and marketing cost. MS is crazy. I can't believe the approach they have taken with the Xbox one. I have a 360 but I outright refuse to buy a one. Most of my Xbox titles are used copies and without that I wouldn't have them. The publisher may not have gotten my money on the initial purchase but they did get it with the dlc I bought. I just can't help but laugh every time I hear or read anything about the one. very good point, I've rarely traded in a Nintendo game unless it turned out that I just didn't like it to begin with much. I wouldn't call it a strategy, though, as much as just a claim to greatness. Nintendo probably still is the worlds best with game software, whether you like the family friendly design approach or not, it's just fun stuff. Mario has stood the test of time because they're fun to play again no matter how many times you've won them. I do wish they could branch out a little from the old IP's but I'm still considering a WiiU as a secondary console to a PS4 so I don't miss some of the big titles. I agree with Reggie.Nintendo first party games never come cheap second hand and there is a reason why.I missed Reggie being at E3 on stage because that man could sell ice to the eskimos and as sweet as the nintendo directs are they are lacking a bit of passion.Reggie could present a nintendo direct about a squeeky rubber dog toy in the shape of Mario and I would think about buying it even though I don't have a dog. @ferthepoet I don't think he's crapping on 3rd party publishers as much as he's crapping on xBoned. "Well, the fact remains that I still have Super Mario Galaxy even though it's 5 years old." @LegendaryQ Games like the Galaxy twins are soooo good you would be insane to trade them in. I still pop it in a few times a week to replay some of the more inventive levels that are a joy to play... the game will never get old. Nintendo games are amazing. I wouldn't exchange any of the games I got for my 3DS. I rarely trade in used games and the few Nintendo ones I have (in my adolescent years) I regret to this day. It's true. Nintendo makes the best games on the planet, and I buy their consoles solely for their games. I remember trying to get NSMB Wii used, and it was still a ridiculous price — EB Games has new at $65 and used at $45. I just don't have the heart to trade in Nintendo games. I want to keep them forever. I am glad someone in the industry finally says what I have been saying. We don't owe publishers more money; they owe us better games. They think video games are some special market, but it isn't. I can buy a used home, a used car, used underwear, etc. And I can buy used games. That is our right. They want to trick people into feeling sorry for them and paying more, but I do not give beggars business. @FiveDigitLP I bought Other M for a fiver and I thought it was awesome.The story was like bad soap opera and I thought that was a big plus point and the game was really fun.It was a great game and it should have sold a lot better than it did.It's no suprise Retro done a Donkey Kong sequel.Platinum are the new Retro. If the games they make do well they will rule the world.Platinum are ex Clover who made Okami.I really hope they have some involvement in Zelda HD.Anyway you and Reggie are right. Not that he is not right, but also the fact that kids are on the receiving hand of many more Nintendo games that others also influences this small trade-in ratio. Reggie my man,you are an absolute genius! Who would have thought: I have never sold back Mario Galaxy, or any of the Karting games. Occasionaloly I might sell a spinoff, but overall, I gotta have my first party titles. Even if it's been a while since I've played a particular game, say for instance Paper Mario: The Thousand Year Door or Mario Sunshine on the Game Cube, I keep it in my collection knowing that it's great and if I ever get the urge to play it again, it will be right there waiting for me. Honestly, some third party games are just "meh" and if it doesn't hold interest, I sell it back. This applies to current games and retro too, but I always try to buy current generation games new to support the publisher and beef up my Club Nintendo Reward Points. Reward Points are another huge incentive to buy new. Rarely have I agreed with Reggie in the past on things, but he's got a great point on quality and re-play factor. Something that the competition and their 3rd party devs don't dive into on a regular basis. And you know what? They've been taking shots at Nintendo for years, its nice to see some life in NOA boss. Used Nintendo games sell at a premium because they are quality and rarely do people give them up. Go on Amazon and tell me how much a new (unopened) GCN of Wind Waker is going for these days... $140. Used, $40+.. Its all about supply and demand and the quality behind their product. Heck, my original copy of Zelda II sitting on my mantle would probably fetch grocery money for a week if I wanted to sell it. Pokemon GBA games still sell at like $30-$35 used where I live. There is almost no difference in buying say a pokemon or smash bros game used. This is why Nintendo does well. I still got all my pokemon games all the way back to my first one. I only lost like two Nintendo games on accident and that was because I was younger and wasn't really a "collector" yet. I have never sold a game I have bought, and I would definitely never sell a Nintendo one. I still play my Nintendo 64 games like Jet Force Gemini and Donkey Kong 64 to this day, and once my cartridges die (hopefully they never will) I will have to go out and buy them again. Point is, no one makes games as replayable as Nintendo, hence why I have played Ocarina of Time 10+ times over the years. Amen, Nintendo. I have been an admitted Nintendo fanboy for many years and have sold their games away one time — selling an old N64 at a garage sale several years after the GC was out. I regularly look through my library of 360 games and wonder why I bought them in the first place, and though I don't actively seek to sell any games, I have sold a few of them when people have expressed an interest and I realize I haven't booted it up in 2 years. Nintendo games are iconic, engaging, original and replayable. Very few other companies can say the same about most of their games. Nintendo and Take Two studio are the only ones that understands why the used game market is the way it is today. But its always easier to blame there failings on others. I couldn't agree with Reggie more. The greater the game, the less likely I want to get rid of it. And frankly, Nintendo's position on this is clear with their console design and their take on quality games. That's why I love Nintendo. Even when the chips are down and the industry chuckles at them, there are many of us quietly enjoying their brand of gaming. Yet another reason Reggie is so boss. I was actually just talking to my brother about this the other day. It's nigh impossible to find used 1st party Ninty games, and if you do manage, it's likely only 5 bones less, so you may as well pony up for a fresh, new copy! It used to irk me because my cheap side couldn't catch a break, but with Reggie's statement here, I've realized even more why I respect and love Nintendo. Quality games through and through. Although my wallet would appreciate a few more sales now and then. "Used games hurts developers" is just the mythical boogeyman illusion constructed by publishers and industry marketing executives this time around. In the past, it was "quirky games will never sell" and "rentals hurts attachment rates" and "cartridges are not worth the price premium over discs" and "piracy will crash and bankrupt the industry". All of those things have been dead wrong, and once again, this is just another ploy to trick people into believing them. Thats exactly how it should be. If someone doesn't value your product enough to keep it thats a problem with your product, not the consumer. Second hand sales are no where as big a problem as they make them out to be, its just so much easier to point at the monster under their beds than tackle the real problems within the industry. Players only have so much money they will spend on games. If the games are bad, they will need more games for the same amount of money, which translates into selling and buying used games. The only effects long term the restriction might have is that either MS must sell games for less money, or will loose customers to Nintendo and Sony, where with Nintendo you get more value from every game, and with Sony you can sell them used when you are sick of them after some weeks. 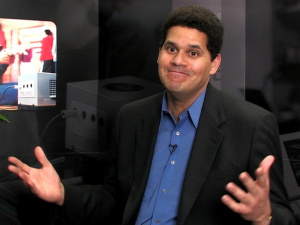 Ha ha, Reggie always states the painfully obvious truth. Shelf life is the problem of the developer. Nindi doesn't have that problem, so they'll sit this one out and let EA, Acty, MS, Sony, and Ubi duke it out. I remember years ago Sony talking about providing short term experiences in order to not disrupt adoption; basically they meant making games without any replay value and in some cases only giving pieces of the full experience. It's a completely different business model. I think Reggie definitely nailed that one. Make better games and people will not sell them; that is just plain logical. Genius. You know, I have wrote so many comments here and on IGN in defense and praise of Nintendo. It might sound like fanboy-ism, and I'm sure it appears that way. But I do own and enjoy all of the other consoles. However, one of THE biggest reasons that I love Nintendo is that they very simply KNOW the business. And they know business in it's purest form. They are in business to make money and they do so by listening to their consumers and providing what they want, while still managing to innovate. When they make mistakes or misread the market, they are very open with their mistakes. And with all humility, they set forth to fix them. I not only love the games and hardware that only THEY know how to make, but I love how they do business. @FiveDigitLP I did'nt take offense to your comment mate.I was just trying to make it known that it's a really good game.If you play it you will have fun..Your a friendly person and I think if your play Metroid other M you'll understand why Nintendo don't take many risks. He does have a point here! I still have my snes and my n64 which still get play times inspite of the fact that i have a ps3 and wii also rigged up.. when 3 of my mates come over to visit, its usually the mario kart 64 battle we end up playing.. our fav map being lava doughnut, we must have put more that 1000 hrs into that.